This keynote is based on Mark’s best-selling book, High-Profit Prospecting – Powerful Strategies to Find the Best Leads and Drive Breakthrough Sales Results. The quest for leads and prospects is a never ending battle. Salespeople are quick to blame everything but themselves for their own shortcoming when it comes to prospecting. 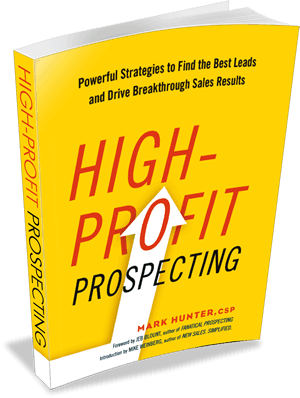 Mark Hunter, CSP, “The Sales Hunter,” in his fast-paced and engaging style, will have everyone assessing what they’ve been doing. More importantly, he will equip them with strategies they can use immediately! With Mark Hunter as your keynote speaker, you get content and motivation. It’s why he’s shared the platform with such prominent speakers, including Seth Godin, Tony Robbins, Gary Vaynerchuk, Simon Sinek and others. Attendees will leave the session believing they can fill their pipeline with the right prospects and, better yet, they’ll leave with specific steps they need to do to make it happen. Organizations struggling with prospecting and keeping the sales pipeline full. This program is an excellent “sales kick-off” program, as it will help prepare and motivate the sales team for what needs to be done. Excellent for associations that have members who are going through challenging times finding new business in their industry. Also fits well for audiences of business owners who have small sales teams and are struggling to make their sales efforts more efficient.